Drake Flor is the fellow on the right . My name is Josh Smitley, and I recently received your scholarship for incoming jazz musicians. First of all I would like to thank you so much for sponsoring this scholarship! It was really an honor and an encourager when I found out that I had "won" it! And it has really helped pay for school so thank you! I have been playing the alto sax for the past 4 years. Before that, I played 4 years of clarinet and 3 years of piano. But I have seen a lot of improvement over the past years that I have played the sax (the 4 years of high school). The second year in high school, I joined a jazz ensemble solely committed to playing big band jazz charts. We got selected twice to go to Monterey, California for the NeXt Generation Festival (a part of the Monterey Jazz Festival). Only 6 bands who audition from around the U.S. get picked so it was really a great honor to be able to go two consecutive years! In school, I was a committed member of all the different bands (marching, pep, jazz, concert) but definitely loved the jazz band the most. I held my position of 1st chair alto well since sophomore year. In both my junior and senior years, I recieved the Louis Armstrong Jazz Award. 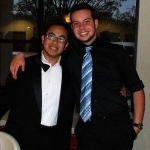 In high school, I learned a lot about jazz and musicianship in general. I hope my growth over the years will continue through college and my goal is to become a professional jazz musician. Thank you once again for providing the money for this scholarship! If there is anything else you would like to know, please let me know! As the recipient of last years Shellist Memorial Music Scholarship, I am happy to say how helpful the Scholarship was for me during the first two semesters of my college career. Without this Scholarship, getting through the last two semesters would have been extremely difficult. With the $500 dollars I received for each semester, I was able to easily pay for the textbooks I needed for my classes, as well as various musical supplies I needed. As of now, I am continuing my education to become the best musician I can be. I am enrolled in 6 class (all music classes) and couldn't be happier with my decision to pursue music as a career. After college, I still plan on becoming a world traveler and musician, and to experience music of different cultures and become a more well-rounded person. Bernard Shellist, born Aug. 20, 1916. A Ukrainian immigrant spent his boyhood in Canada playing violin and trombone at local weddings and festivals. In the 1930s, he played lead trombone with the orchestras and big bands. Touring across Canada and the United States with the Mart Kenny Orchestra, he entertained the public and the troops, sponsored by Coca-Cola during the war. In 1946, Bernie married vocalist Rita Lillian Jones in Hamilton, Ontario. Rita was of Welsh decent and began her career singing with the Good Deed Choir on the radio in Canada, but her real dream was to be a big band singer. She accomplished her goals singing with her own trios, combos and many of the orchestras her husband Bernie played in. In 1953 the couple immigrated to Los Angeles, California where they continued playing music, golf and selling real estate. In 1973 they moved to San Diego and joined the AFM local 325 where they met the local musicians and played all over San Diego county. 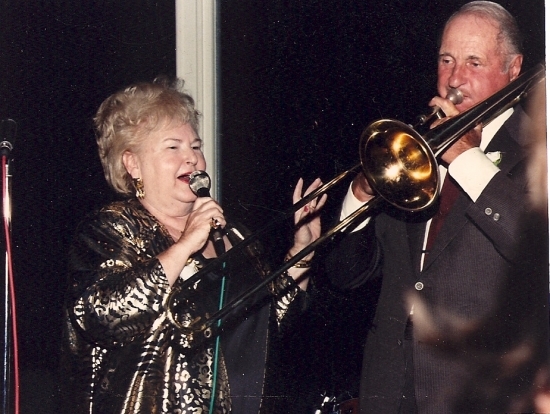 Bernie Shellist - who practiced his horn religiously everyday of his 91 years - spent every Wednesday night for the last 25 of those years at Mesa College playing trombone with conductor David Greeno's Orchestra. He never missed a band practice or a gig - short of an emergency. You would see him playing at all kinds of events from Viejas Casino, to the Band shells in Balboa Park and Coronado, to smaller venues clubs like Tio Leo's, Mission Bay Yacht Club and more. Both Rita and Bernie would be honored to know that the music that gave them so much pleasure is being passed on to young musicians here at Mesa College. TO THOSE OF YOU WHO HAVE CONTRIBUTED TO THE SCHOLARSHIP FUND THANK YOU!!!! PROCEEDS FROM THE SALES OF RUNWAY RUNAWAY WILL GO TOWARDS FUTURE SCHOLARSHIPS AT MESA COLLEGE TOO!